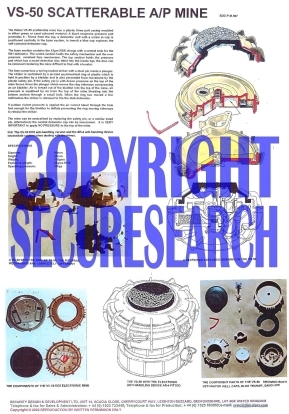 This security poster illustrates the VS-50 Scatterable Italian Anti-Personnel Mine. This mine is designed to be dispensed by helicopter for area denial. It incorporates a bellows mechanism to prevent operation from violent over pressure and can be deployed with an electronic anti-handling mechanism. This security poster features the technical specifications of the VS-50, a detailed, sectioned exploded drawing of the VS-50, photographs of the components of the VS-50 EO3 electronic mine and the component parts of the VS-50, a photograph of a VS-50 with the similar TS-50 to show how the internal mechanisms are completely different, and the VS-50 with the electronic anti-handling device AR-4 fitted. A detailed, sectioned exploded drawing of the VS-50. A photograph of a VS-50 with the similar TS-50 to show how the internal mechanisms are completely different. The VS-50 with the electronic anti-handling device AR-4 fitted. Photographs of the components of the VS-50 EO3 electronic mine and the component parts of the VS-50 that shows both detonator well caps, blue transit, sand live. The technical specifications of the VS-50. This security poster features the technical specifications of the VS-50, a sectioned exploded drawing of the VS-50, photographs of the components of the VS-50 EO3 electronic mine and the component parts of the VS-50, and the VS-50 with the electronic anti-handling device AR-4 fitted.